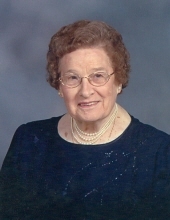 Ruth M. Schulz, 97, of Charlotte, Mich., previously of Berrien Springs, passed away Thursday, July 26, 2018, at Eaton County Healing and Recovery Center, where she was so caringly assisted following a short illness. She is survived by her daughter, Connie (Al) Wolf of Charlotte; two grandchildren: Grant (Lyn) Wolf of South Bend, Ind., and Dani (Brett) Linsley of Charlotte; great-grandson, Drew Linsley of Charlotte; and nieces and nephews. Funeral services will be Wednesday, Aug. 1, at St. John’s Evangelical Lutheran Church in Baroda. Friends may visit beginning at 10 a.m., and service will begin at 11 a.m. with Rev. Nan Dehnke officiating. Burial will be in Spring Run Cemetery, St. Joseph. In lieu of flowers, memorials may be made to the church. Allred Funeral Home, Berrien Springs, is entrusted with arrangements, and messages for the family may be left online at www.allredfuneralhome.com. To send flowers or a remembrance gift to the family of Ruth Marie Schulz, please visit our Tribute Store. "Email Address" would like to share the life celebration of Ruth Marie Schulz. Click on the "link" to go to share a favorite memory or leave a condolence message for the family.